Looking for the best produce deals this week? 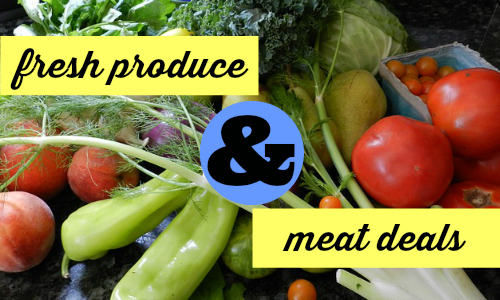 You can find fresh meat and produce deals in Bi-Lo, Publix, Harris Teeter and Whole Foods. Plus, if you are following the Whole30 diet or Paleo diet, this is a great list for you! Note: I have tried to create the most accurate meat and produce deals that would fit into the Whole30 or Paleo lifestyle, but each person is different and will need to decide which of these items fit your particular diet. Publix – Hass Avocados, $1 ea. Publix – Cantaloupe, $2.50 ea. Harris Teeter – Navel Oranges, 60¢ ea. Harris Teeter – Pineapples, $2.99 ea. Publix – Corn, 40¢ ea. Bi-Lo – Corn, 33¢ ea. Harris Teeter – Hot House English Cucumbers, $1 ea.